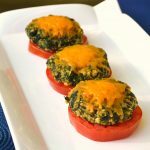 Spinach Stuffed Grilled Tomatoes are large beefsteak tomatoes hollowed out and filled with creamed spinach topped with cheddar cheese. This spinach can be fresh and steamed or you can use frozen chopped that is cooked and drained. Adding Pepperidge Farms Cornbread dressing crumbs to the creamed spinach makes the spinach flavor pop and helps form perfect spinach patties or rounds. Make creamed spinach recipe. To creamed spinach add cornbread crumbs and butter. Form spinach mixture into patties the same width of tomato slices. Place patties on top of tomato slices, add grated cheese. Grill on medium high heat until cheese melts and tomatoes are heated. In medium saucepan, sauté thawed spinach until it turns bright green. Drain and squeeze dry. In same saucepan, heat cream, nutmeg, and salt, cook for 5 minutes to reduce slightly. Melt butter in small saucepan, add flour. Stir slurry to thick paste. Add to cream mixture and stir. Add squeezed spinach. Stir to combine and to creamy consistency. Correct seasonings and serve warm or with the grilled tomatoes. If you decide not to grill these, you can place these under your oven broiler, and broil until cheese melts. These are delicious and so pretty on a plate. This creamed spinach can be made ahead and then warmed prior to grilling. The spinach rounds are placed on top of a ½ inch thick slice of a ripe large beef-stake tomato, then topped with shredded sharp cheddar cheese and placed on the grill until the cheese melts.